Minimal signs of wear on packaging only - item itself is in pristine condition. For warranty information, refer to "In the Box" contents. 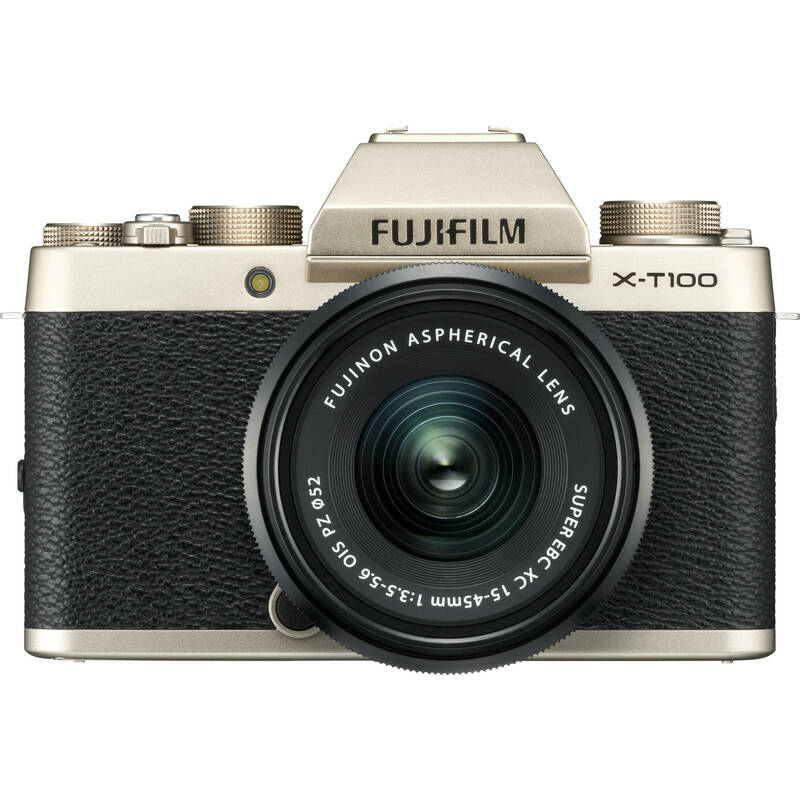 Characterized by its compact profile and refined appearance, the Fujifilm X-T100 is a versatile mirrorless camera perfect for everyday shooting. Sporting a high-resolution 24.2MP APS-C CMOS sensor for recording stills and video, the X-T100's imaging capabilities are rounded out by a fast and precise hybrid phase- and contrast-detection autofocus system as well as sophisticated SR+ Auto settings to accurately depict a wide variety of scene types. Creative shooting endeavors are benefitted by the inclusion of Film Simulation modes, to mimic the look of classic Fujifilm films, along with Advanced Filter modes for unique effects. The sleek body design incorporates both a 0.62x-magnification 2.36m-dot OLED electronic viewfinder, for intuitive eye-level shooting, and a 3.0" 1.04m-dot three-way tilting touchscreen LCD that can face forward for accurately composing selfies. The camera body is also distinguished by its champagne gold anodized-aluminum finish, top dial controls, and retro aesthetic. Additionally, Bluetooth low energy and Wi-Fi allow you to wirelessly share imagery from the camera to a mobile device and the included rechargeable lithium-ion battery offers up to 430 shots per charge for all-day use. The 24.2MP APS-C CMOS sensor enables recording high-resolution stills and video in a variety of lighting conditions. It offers a native sensitivity range from ISO 200-12800, which can be expanded to ISO 100-51200 to better suit working in ultra bright or ultra dark scenarios. UHD 4K video can be recorded at 15p, or for more versatility, Full HD 1080p recording is possible at 59.94p, 24p, and 23.98p frame rates. For stills shooting, a continuous rate of 6 fps is possible, as well as a 4K Burst Shooting function to shoot 8MP stills at 15 fps. Complementing the imaging capabilities, the sensor also affords a 91-area hybrid autofocus system that uses both phase-detection and contrast-detection methods for quick and precise AF. For eye-level shooting, a 2.36m-dot OLED electronic viewfinder is featured, and has a 0.62x magnification for comfortable viewing. Rear 3.0" 1.04m-dot touchscreen LCD is also available and features a unique three-way tilting design to benefit photographing from high and low angles, as well as front-facing selfies. Built-in Wi-Fi and Bluetooth Low Energy allow you to wirelessly share your imagery to a linked mobile device. 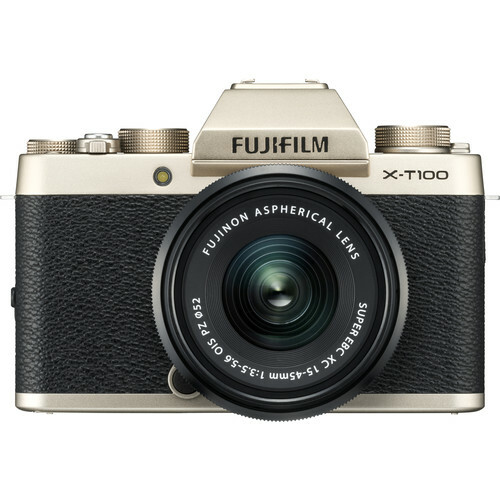 Retaining the retro aesthetic that Fujifilm's X-series of cameras are known for, the X-T100 features a similar silhouette with an especially lightweight and compact profile and a striking champagne gold finish. A detachable grip is included for improved handling. Dedicated Mode and Function dials offer intuitive adjustment of specific camera functions. Built-in pop-up flash is available to provide additional illumination when working in low light, and the Super Intelligent Flash technology automatically balances flash output according to your scene. Included with the camera body is the XC 15-45mm f/3.5-5.6 OIS PZ lens; a compact 23-69mm equivalent zoom spanning wide-angle to portrait-length focal lengths. The lens features three aspherical elements and two extra-low dispersion elements to realize a well-corrected image void of spherical and chromatic aberrations. Its versatile zoom range is further complemented by a 5.1" minimum focusing distance for close-up shooting, Power Zoom for easily adjusting your focal length; and three-stop-effective optical image stabilization to suit handheld shooting. Advanced SR Auto mode automatically recognizes scene and subject types in order to intelligently adjust the camera settings. Film Simulation modes allow you to mimic the look of numerous classic Fujifilm film types, including Provia, Velvia, Astia, Classic Chrome, PRO Neg, and several Monochrome modes. Advanced Filter modes: Toy Camera, Miniature, Pop Color, High-Key, Low-Key, Dynamic Tone, Fish-Eye, Soft Focus, Cross Screen, Partial Color (Red, Orange, Yellow, Green, Blue, Purple), Fog Remove, and HDR Art. Multi Focus mode automatically composites several differently focused exposures into one in order to extend the effective depth of field. Box Dimensions (LxWxH) 8.5 x 7.75 x 5.25"
X-T100 Mirrorless Digital Camera with 15-45mm Lens (Champagne Gold) is rated 4.6 out of 5 by 13. Rated 5 out of 5 by Kana from Solid first camera I've had a handful of point-and-shoots up to today, but I decided to finally splurge on a mirrorless camera to take with me when I travel. So far, the X-T100 has some cool features... the sensor to activate the EVF threw me off (in a good way), crisp touch-display, the hand feel and weight is nice, too. The only thing I'm bummed about is that the camera doesn't come with a battery charger- only a cable to plug into the camera itself. It makes it a bit more difficult to charge my extra batteries, but the world continues to spin. It's not the fanciest camera by any means, but I can tell the X-T100 and I will be good friends for lots of trips ahead. Rated 3 out of 5 by Gene from brilliant in some respects, very flawed in other Hard to say what Fujifilm were thinking releasing this camera. On one hand this camera is capable of producing a really stunning images. The image quality is superb, in my view Fujis bayer CFA works better than X-Trans, especially if you are using Adobe Lightroom or ACR. The colors and tonality are very pleasing and images are sharp and detailed. On the other hand, the auto-focus is dismal. It reminded me the first release of X-E1. Its very slow, sometimes it may take a second to take a single picture. So if you have an animal or a human in the frame they would likely change their position before the camera actually takes a picture. Such AF is not only very impractical, its quite annoying too. And in low light (like night streetlights) it simply refuses to AF altogether. Rated 4 out of 5 by Phillip from Great with shortcomings This camera was purchased as a light weight, compact travel camera for my wife as an alternative to my larger hand-me-down D7000. Overall, we're happy with the purchase as there are a number of positive attibutes regardin this this camera. To start, the auto focus is spot on and the image clarity is excellent. I was worried that the stock lens that came with the body would compromise image clarity but it's actually quite good in spite of feeling very "budget" like. This camera also has excellent low light capability with very little offensive noise at higher ISO. The various "Fuji Film" filters that can be applied in camera are very good and color saturation out of camera is excellent. As mentioned earlier, it was meant to be light and compact travel alternative - and it fits that niche well, if not too well. Lastly, the price point is pretty reasonable given the image quality and body build, which is solid for its size. Unfortunately, nothing is perfect. With this frame, you don't have to have large hands for this thing to feel small. And the Menu/AF/WhiteLight Balance buttons are positioned in such a way that my wife kept hitting them with her palm while shooting, which typically sent her into White Light Balance adjustment resulting in a few lost shots. The solution is simply retraining hand placement. As far as the buttons/knobs go, the default setup is OK and I didn't make any adjustments. The quickie menu button near the viewfinder is well placed and useful. The main menu, however, is not bad but not exceptionally intuitive either. There are a few functions that are buried and hard to track down. As is documented in many of th online mirrorless reviews, the 4K video is useless at 15 fps but we were buying a camera, not a video device so that was not a concern in our purchase decision. The biggest concern cam about half way through our trip when, in the midst of shooting, the camera just froze up. Even the On/Off tab would not shut the camera down. After playing with it for a few minutes, I took the default action of removing the battery, waiting a minute and replacing it, which reset everything and the camera went back to normal. I'd like to know if others had this experience and whether it's normal for this model. The last downer on this camera is that the RAW format is not recognized by Adobe LR so you have use their external program to convert files to *.dng before importing. All things considered we are happy with the purchase for the compact portability and exceptional photo quality this camera deliveres for the price point. Rated 5 out of 5 by Bill from This is an amazing little camera. Wow! I can not believe the performance a person can get from an apsc sized sensor, especially for this,price. The results are stunning. Fuji is really on to something with their color processing, litterally takes seconds in post processing because of this. The colors are so saturated and sharp, yet still in a believable sense. Do not sleeep on this camera because of the price, it’s easily worth twice hay it’s going for. It has out shot my 6dii on some occasions. And the “kit” lenses, what can I say, no other camera company 8n my opinion have created such high quality lenses at this price. Yes they are variable aperture, yet the bokeh produced is on par with some of Canon”s more expensive lenses. Just simple, light, cost effective, and has an eyepiece. Exactly what I was looking for! Rated 4 out of 5 by Thomas from EVF, 24mp, Fuji Lenses, what's not to like? It's well built, has very good electronic viewfinder (EVF), has an extensive paperback manual, tiny charger, and it comes with a very nice add-on grip. This combination of EVF, 24mp sensor, and the Fuji lens mount is long overdue. The Bayer sensor eliminates all concern about post processing since the older X-trans sensor was constantly plagued with controversy on this issue. And, the price is right! I've been using the camera for a couple weeks, mostly with my fully manual third party lenses. I also used a Fuji 23mm F1.4 lens with a Fuji EF-42 flash for shooting baby pictures, and it works great with all of this. It uses the standard battery that Fuji uses in all their higher end X cameras (I have an old X-E1), so I did not have to buy a spare battery. Making the transition from the old X-E1 to the new X-T100 was easy for me since I am already familiar with the Fuji system, but the extensive paperback manual should answer all your needs even if you are new to the Fuji system. I'm delighted with this camera so far and I highly recommend it. I gave it only 4 stars because the eye-relief of the EVF is a little bit shorter than it was on my X-E1 and, as a wearer of glasses, this means it is a little bit more difficult for me to use the EVF. Rated 5 out of 5 by Lynne from Fuji X-T100 Had this camera for a couple of months. Love it. Takes great photos. I am still learning. Rated 5 out of 5 by Harold from Love This Camera Just got the camera yesterday and took about 70 pictures. Updating the firmware was easy. The kit lens quality is good. I have to get used to handling the camera, I inadvertently went into the menu a few times and changed settings. The accessory items were a plus. The camera bag is a perfect fit for the camera.